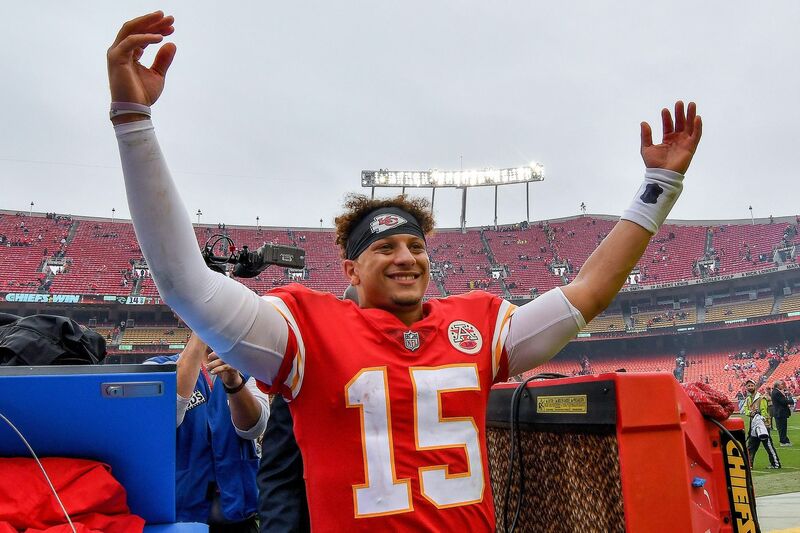 NFL Week 6 preview: Can Patrick Mahomes’ Chiefs beat Tom Brady’s Patriots in Foxborough? Patrick Mahomes leads the Kansas City Chiefs into Foxborough, Mass., to face Tom Brady’s New England Patriots on Sunday. ESPN had a stat that no quarterback under the age of 24 has ever beaten a Bill Belichick team in Foxborough. (Patrick Mahomes just turned 23.) The Chiefs thumped the Patriots in last season's opener when Alex Smith was their QB. Kansas City star pass-rusher Justin Houston missed practice this past week with a hamstring injury. Tom Brady is going for his 200th regular-season win. He's 199-57-0 since 2001. By comparison, the Eagles are 163-113-1 in that same span. Line: Patriots by 3.5. L.A. Chargers (3-2) at Cleveland (2-2-1), 1 p.m.
Baker Mayfield has been terrific, but the defense is a key reason people are jumping on the Browns bandwagon. They have forced 15 turnovers, tops in the NFL and more than they generated all of last season. Most heartwarming news this past week came when Snoop Dogg patched things up with Cleveland offensive coordinator Todd Haley. Snoop (or is it Dogg on second reference?) used to criticize Haley when Haley was in Pittsburgh. Only thing nuttier might have been Kanye's visiting the White House. Line: Chargers by 1. Chicago (3-1) at Miami (3-2), 1 p.m. The Dolphins are using super glue and duct tape to keep the offensive line together, which is exactly what you don't want with Khalil Mack coming to town. Bears quarterback Mitchell Turbisky is coming off a six-touchdown win against Tampa Bay, which was followed by a bye. Chicago tight end Trey Burton caught a touchdown in two of the last three games. Line: Bears by 3. The Bengals gave away last December's game with a club record 173 yards in penalties. It also cost them a playoff berth. As Steelers linebacker Bud Dupree said, "Cincinnati game: I hit you as hard as I can, you hit me as hard as you can, but we're going to talk trash after the play. It's a real-life fight out there." Line: Bengals by 2.5. Baltimore (3-2) at Tennessee (3-2), 4:25 p.m. The Titans have scored six offensive touchdowns in five games and needed overtime for one of them. They're also in first place in the AFC South. Baltimore leads the league in scoring defense at 15.4 allowed per game. The over/under is 42, which might be tough to get. Line: Ravens by 3. No team is more entertaining when struggling than the Cowboys. Twitter bickering with former players. Receivers say don't blame us. Now they get a Jags defense that was just embarrassed by the Chiefs. Line: Jaguars by 3. Postgame headline: Who had Jason Garrett in the first-to-get-whacked pool? The Panthers will be boosted by the return of tight end Greg Olsen, who missed the last three games with a broken foot. "I call him 'the dictator' in the huddle because I really have problems with calling plays — even in year eight," admitted quarterback Cam Newton. "And he kind of helps me." Line: Redskins by 1. L.A. Rams (5-0) at Denver (2-3), 4:05 p.m. Von Miller is blaming himself for the Broncos' three-game losing streak, though Case Keenum's erratic play is more the reason. Miller has not recorded a sack since Week 2. "I like living in a world where … the problem is me and the quickest way to fix it is me," Miller said. Temperatures are expected to be in the 20s with flurries in the forecast. Line: Rams by 7. Tampa Bay (2-2) at Atlanta (1-4), 1 p.m.
Fitzmagic officially gives way to Win-sanity, at least for a week. Jameis Winston is not signed beyond this season and a trip to Atlanta is a good way to start his audition for a new deal. The Falcons have given up a league-worst 20 touchdowns, including 12 through the air. Line: Falcons by 3.5. Arizona (1-4) at Minnesota (2-2-1), 1 p.m. The Cardinals have lost nine in a row in Minnesota, a string that dates back to 1977, when Jim Hart beat Fran Tarkenton. Minnesota's Adam Thielen can become the first NFL player ever to have 100 receiving yards in each of his team's first six games. Charley Hennigan started with seven in 1961, when Houston was an AFL team. Line: Vikings by 10.5. Seattle (2-3) vs. Oakland (1-4) at London, 1 p.m. This will be the first game for Oakland running back Marshawn Lynch against Seattle, the team he helped win a Super Bowl Should have won two if Pete Carroll didn't outsmart himself. Seattle's Russell Wilson is 25-6 after losses. That's pretty cool. Line: Seahawks by 3. Buffalo (2-3) at Houston (2-3), 1 p.m.
J.J. Watt is tied with his little brother, Pittsburgh's T.J. Watt, and Cincy's Geno Atkins for the league lead with six sacks. "It's incredible," J.J. Watt said. Line: Texans by 9.5. This will be the first of four prime-time appearances for the 49ers over the next eight weeks. The Week 13 Sunday nighter at Seattle could get flexed. The Packers are getting healthy again at wide receiver. Line: Packers by 9.5. Indianapolis (1-4) at N.Y. Jets (2-3), 1 p.m. They're honoring the 1968 Jets, which stunned the Colts in Super Bowl III, so expect a Joe Namath sighting. Indy again could be without No. 1 receiver T.Y. Hilton. No guarantees, but expect a Jets win. Line: Jets by 2.5. I have received your care package of peppered skunk tails and dried mouse ankles. The unit reached New York only to be informed the Aircraft men want to battle in New Jersey. Frustrating. Their indecisiveness may be due what I am told is severe gangrene.